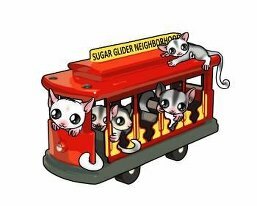 Have you lost a beloved sugar glider? Has someone you know had a glider go to the Rainbow Bridge and you want to do something to help comfort them, but just don't know what to do? Unfortunately for us, gliders have a relatively short lifespan. The gliders that have touched our lives will remain in our hearts forever, but there is also a way they can be memorialized for others to see and for us to know that they will not be forgotten. 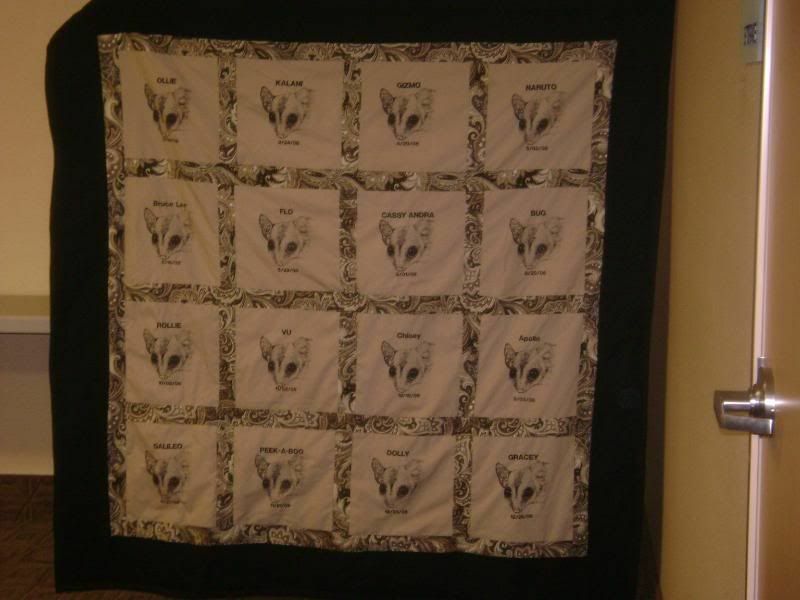 The SUGAR Group will be selling squares for the 2009 Memorial Quilt from Now - 06/15/10. The squares are $20.00 apiece and will be sewn together into a beautiful quilt which can be sent to and displayed at any glider gathering or special event. You can purchase a square by sending your money via paypal to sugargroup@hotmail.com. Be sure to include the glider's name and date of passing with your payment. 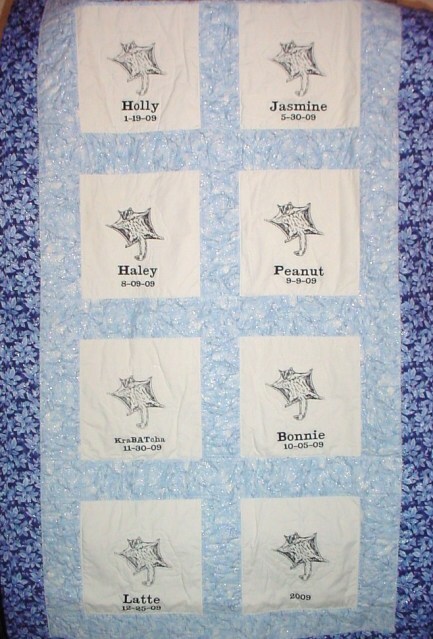 For those who would like to memorialize gliders who have passed prior to 2009, we are also selling squares at any time, in order to make more quilts for those gliders who were lost in various years. Once we have 16-20 squares, a quilt will be made and another one will be started. It's a sad fact that we outlive these precious creatures and many have lost their cherished furbabies. We would like to give everyone the opportunity to have their treasured memories put in a timeless piece of art to be shared by all. 2 weeks left to purchase squares for the 2009 quilt. Only 1 more day to purchase squares for the 2009 quilt! Memorial Quilt squares can now be purchased all year on our website. The 2010 quilt is already being assembled and will be completed by March 1, but there is still time for you to get your squares to honor a glider that was special to you. The quilts are displayed at any gathering that would like to have them displayed throughout the year. Just bumping this up. I hope none of us ever lose a glider, but I know that's just not likely. This is a wonderful way to honor a beloved glider and help a great cause. Only 14 more days to purchase your squares for the 2010 memorial quilt! If you would like to honor the memory of your beloved baby that has passed AND help out a great cause, there is no better way. The 2010 quilt will be displayed for the first time at the SUGAR Group's RRRoundup in March and is already scheduled to appear at other events throughout 2011. Your glider could be remembered through a square with your glider's name and date of passing embroidered on it, but only if you purchase before Jan. 15, 2011. This is a fantastic way to show you care and will always remember their little furry faces. I know, as I had to purchase several squares on this year's quilt myself. As always, if you lost a glider prior to 2010 and want to honor that glider the same, then you can still purchase a square for them too. We are building a "prior to 2010 quilt" as well for all of those that missed out on the quilt for the year their loved one passed away.